ahhhhh! 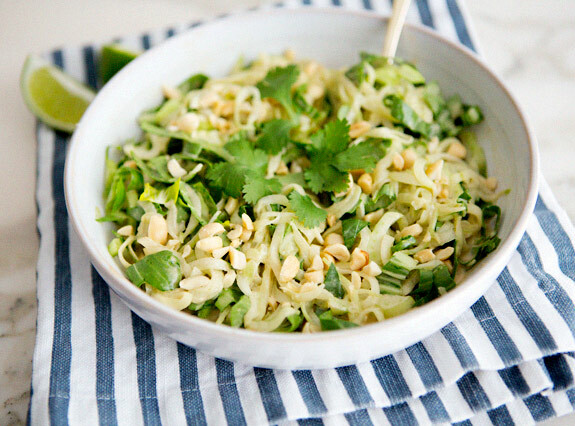 cucumber noodles! enough said. and don’t fret my friends, if you don’t have a spiralizer you can always julienne the cucumber. recipe below. also, you might love this recipe too! – in a small mixing bowl combine peanut butter, maple syrup, tamari, lime juice, sea salt, water and chili oil. chill in refrigerator while you prepare the noodles. Yum!!! I am so making this today. This looks so refreshing- beautiful! I love your blog! I've been lovin the healthy recipies. I tried the banana ice cream the other day, and it turned out great. What a great light dish… this is a must try! 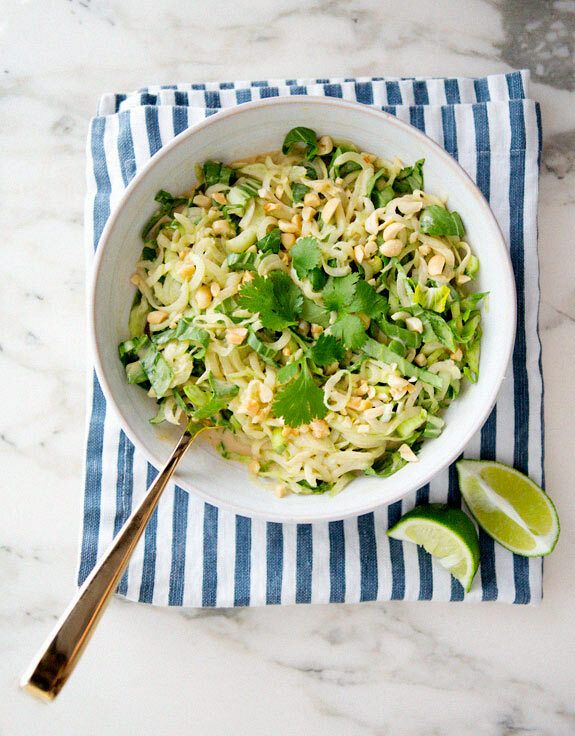 ooooh, i'm loving this cucumber noodle idea! yum! this looks clean and delicious! This one is going on my list. I'm ready for fresh cool foods! oooh pinning this for those hazy hot summer evenings. Gorgeous. Enjoy your heat wave. We've got nothing here in NYC. Nothing but cold, that is. Love the look of this recipe. Great site!! OMG this Thai kinda food are my favourites ! I used agave nectar instead of the maple syrup. The dressing is magnificent . I used the spiral slicer for the first time. It was a bit tough since the cucumber fell on it's side twice. But, the noodles were wonderful. Next time this salad will turn out even better. I made this recipe for my husband and I this weekend and we cannot get enough! It is so delicious and refreshing! Saturday night we paired it with the Thai Chicken Burgers from goop.com. It was a perfect compliment. Thanks so much for your awesome website! Very good recipe, Thanks for sharing the recipe. Linked back to you. I made this tonight – it was great. I've used zucchini noodles before, but never cucumber. It was great. I loved this. I used green leaf lettuce instead of bok choy. So yum yum yum. The cucumber actually tricks you pretty well into thinking you’re eating noodles! This recipe was actually better off used with adult bok choy so you could spoon it into large leaves and eat it as a wrap or veg taco. It wasn’t clear how to cut the baby bok choy leaves and dicing them up didon’t add anything to the delicious, already crisp and fresh cucumber. The recipe could also call for discretion about the water. Mine was already plenty moist and too dripping and soaked with all of the water content of the lime juice tamarind and cucumbers, which is why I had to transfer the result to the leaves to be able to eat it. I absolutely love this Cucumber Noodles in peanut sauce recipe here. I would also love to feature it in our website Greenthickies. Would it be all right if I used one image for it? I will not be posting the actual recipe, but only one image, title, a small quote and then link directly back here. Would it be okay?